When did I suddenly become a baker? I started this blog earlier this year talking about the trepidation I felt about baking, and now... it seems to be what gets my juices flowing! I am really excited about Christmas this year. Mainly because I am spending it in Australia (even though I enjoyed a truly wonderful American Thanksgiving/Christmas experience last year), and because I am making the Christmas cake! 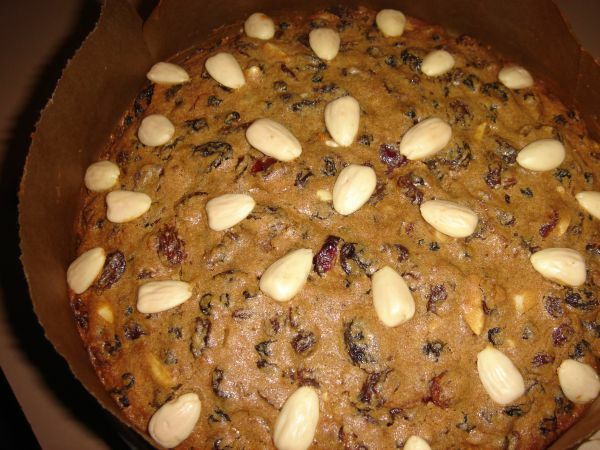 Last week I bought an insane amount of dried fruit to make this cake- which set me back $30. It kind of stung that all the ingredients for just the fruit component of the cake cost that much, along with the fact that I ended up with little piddly bits left over from the quantity my recipe called for. (which now makes me think... fruit pies... hmmm, maybe this excess fruit situation isn't such a bad thing). 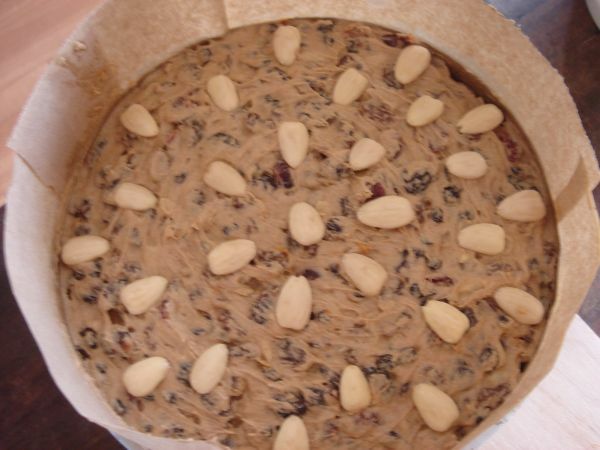 My Mum and Dad had come to visit and brought my two cute, boisterous little Nephews along who are so full of energy (and that age where they still love their Aunt Teddy Bear) and rather than plonk them in front of the Playstation, I decided it would be nice for them to help with the fruit cake. I got them to help measure out the quantities of the fruit, to cut up the dates and pineapple into smaller pieces, to add the rum and to each give the fruit mixture a good stir. They were fascinated with all the different types of dried fruit that went into the cake and I let them taste each one as they added them to the mix. Thankfully the confronting strong smell of rum was enough put them off tasting the fruit once it was mixed in. It was nice to see the boys excited about cooking. I don't think you can ever be too young to learn about food. I hope I have given them a nice memory. Since then, my fruit has been soaking for a week in the refrigerator, with the occasional stir every other day. The recipe only called for 2 days soaking, but I know that when my Mum has made cakes and puddings in the past, the fruit has had at least a week (if not more) worth of macerating. I think it is what gives the cake a wonderful depth of flavour when the fruit is allowed to 'mature'. In the end, it was almost 4 hours until my cake had baked. I took it out of the oven and anointed it with two more tablespoons of rum, then left it to cool. 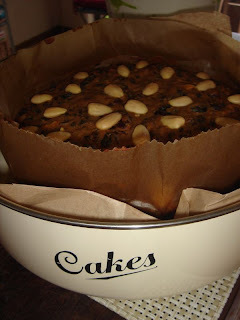 Once the cake was cool I covered it with brown paper and sealed it up in my enamel cake tin. From now it has 6 weeks to do it's thing - become even more delicious! I have to resist all temptation - I really want to sample a slice. I might just have to bake another small cake so I know what I have to look forward to! In a large bowl, combine sultanas, raisins, currants, dates, cherries, dried cranberries, pineapple, mixed peel, rum and orange. Cover with plastic wrap and refrigerate, stirring occasionally, for 1 week to macerate. Preheat oven to 150°C. 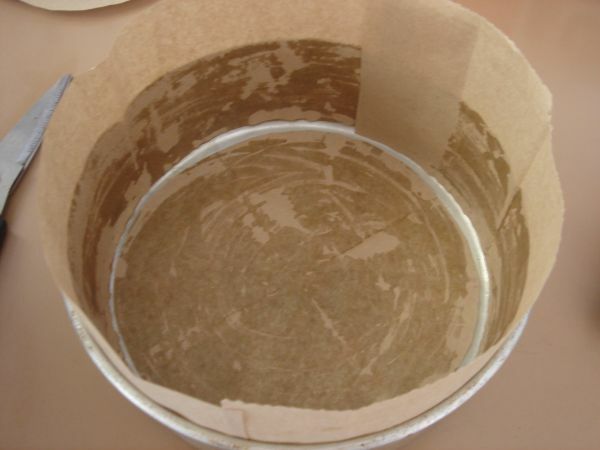 Grease a round 22cm (base measurement) cake pan with melted butter. Line the base and side with a layer of brown paper. Beat butter and sugar in a bowl until pale and creamy. Add eggs, 1 at a time, beating well between each addition. 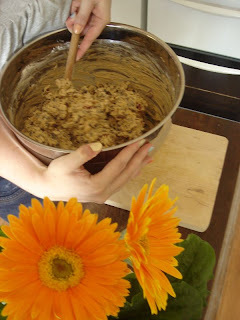 Add fruit mixture to butter mixture and stir to combine. Sift in flour and mixed spice and stir until well combined. Add nuts and stir until combined. If you are lucky enough to have family or loved ones nearby, it is always nice to let them give the cake a stir for good luck. Spoon into prepared cake pan and smooth the surface. Give the pan a light tap on benchtop to release any air bubbles. Arrange almonds in a series of circular patterns on top of the cake. Bake in oven, for 3 hours 40 minutes to 4 hours or until a skewer inserted into centre comes out clean. Drizzle hot cake with extra rum. Set aside to cool in tin before turning out. This cake can be baked up to 3 months ahead. Cover with brown paper and store in an airtight container in a cool, dark place.